, an eminent Italian paintress, was born at Cremona in 1533, of | a distinguished family. 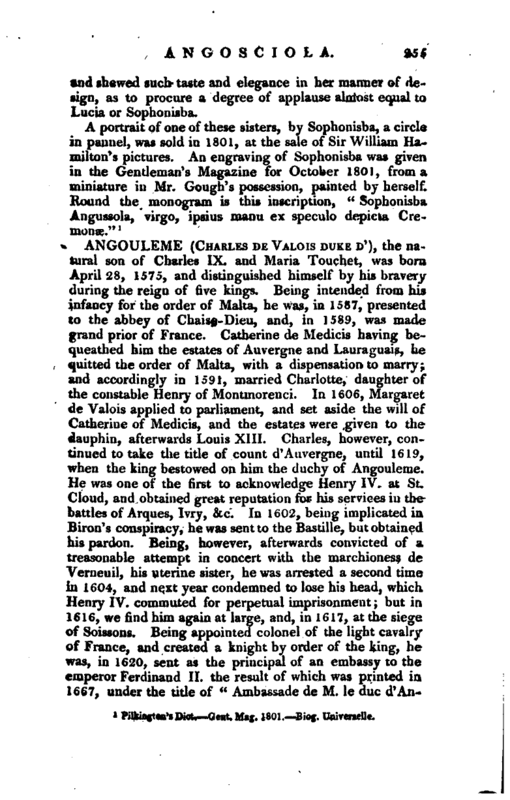 The author of the Museum Fforentinum is guilty of a very remarkable anachronism, in regard to Sophonisba; for he hxes her birth in 1559, in which year it w absolutely impossible she could have been born. This appears incontestabiy from Vasari, who tells us, that she painted the portrait of the queen of Spain, by order of Pope Paul IV. in 1561; and to prove this fact, he inserts the letter which she sent along with the picture to the Pope, and also the Pope’s answer, both dated in 1561; Sophonisba’s from Madrid the 16th of September, and the Pope’s from Rome the 15th of October; at which time, according to the Museum Florentinum, she could have been only two years old, if born in 1559. The first instructor of this eminent paintress was Bernardini Campo of Cremona; but she learned colouring and perspective from Bernardo Gatti, called Soiaro. One of her first performances was the portrait of her father, placed between his two children, with such strong characters of life and nature, with a pencil so free and firm, and so lively a turn of colour, that her work was universally applauded, and she was acknowledged an incomparable painter of portraits. Through every part of Italy she is distinguished by no other name than that of Sophonisba. But although portraits engrossed the greatest part of her time, yet she designed several historical subjects, with figures of a small size, touched with abundance of spirit, and with attitudes easy, natural, and graceful. 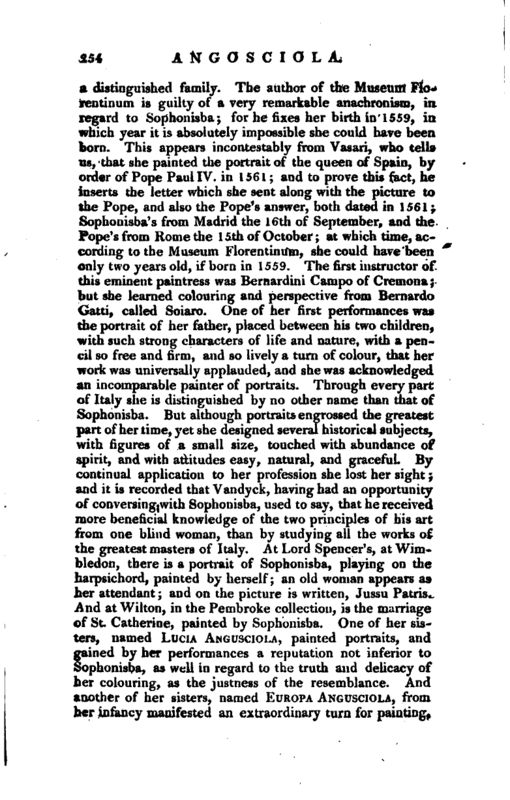 By continual application to her profession she lost her sight; and it is recorded thatVandyck, having had an opportunity of conversingjwith Sophonisba, used to say, that he received more beneficial knowledge of the two principles of his art from one blind woman, than by studying all the works of the greatest masters of Italy. At Lord Spencer’s, at Wimbledon, there is a portrait of Sophonisba, playing on the' harpsichord, painted by herself; an old woman appears as her attendant; and on the picture is written, Jussu Patris. And at Wilton, in the Pembroke collection, is the marriage of St. Catherine, painted by Sophonisba. One of her sisters, named Lucia Angusciola, painted portraits, and gained by her performances a reputation not inferior to Sophonisba, as well in regard to the truth and delicacy of her colouring, as the justness of the resemblance. And another of her sisters, named Europa Angusciola, from her infancy manifested an extraordinary turn for painting, | and shewed such taste and elegance in her manner of design, as to procure a degree of applause almost equal to Lucia or Sophonisba. Pilkington’s Dict. —Gent. Mag. 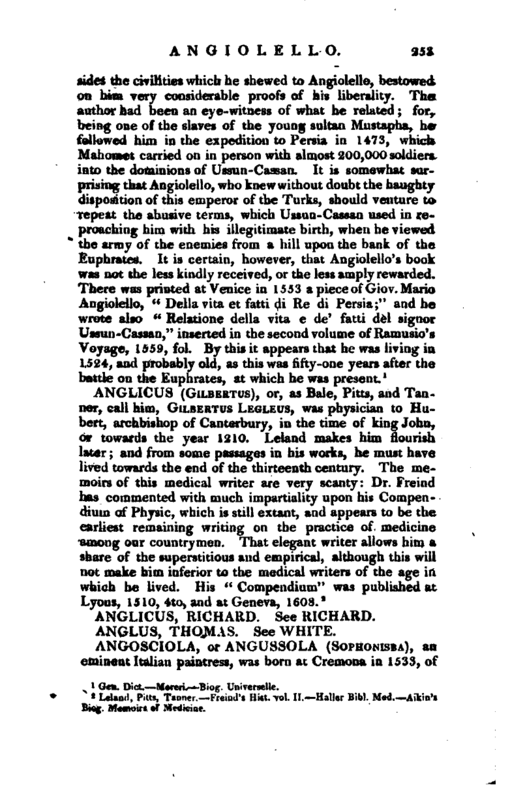 1801, Biog. Universelle.